Adidas is back with another collab with the Atlanta boutique. Adidas and A Ma Maniere have been frequent collaborators over the last few years so it only makes sense that the two would join forces once again for a brand new shoe. 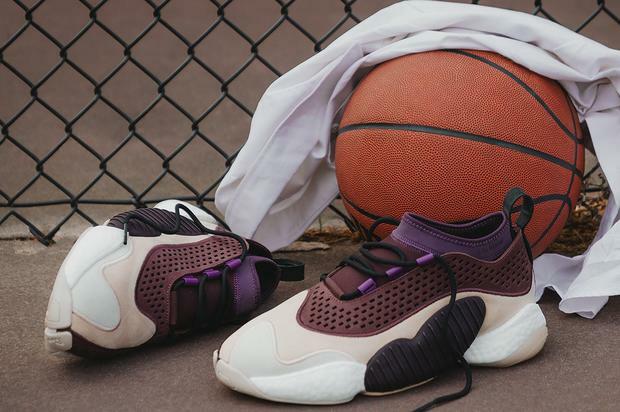 After successful collaborations on the UltraBoost and NMD, the two brands are going back to the boost formula with a luxury version of the Crazy BYW low. This shoe has become unique thanks to its wild Boost midsole that resembles a chunky dad shoe all while the tooling is a stunning departure from the sleek Adidas lifestyle models we’ve become so accustomed to. There are a plethora of different luxe materials on this shoe including purple leather and sandy nubuck/suede which makes up the majority of the upper. The cuff of the shoe is made of a sock-like material, making these extremely comfortable. The cuff itself is purple, while black laces add to the muted aesthetic of the shoe. Adidas and A Ma Maniere fans will surely love this sneaker for the risks it takes, as well as the quality of the shoe as a whole. According to Sneaker News, this shoe will be coming out on Saturday, April 20th for $220 USD.